Large Victorian - to the Beach! 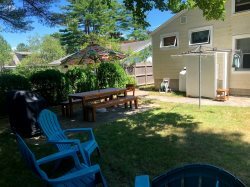 *NOTE: The "Total Price" in the Instant Quote box includes your REFUNDABLE security deposit ranging from $300-$500 as well as 9% Maine State Lodging Tax. The moment you approach this majestic home you will be able to appreciate its beauty in every corner of the home. This home was built in 1900. With 4 bedrooms and 3.5 baths, there is room for the whole family! You are only steps to Little Beach, making it just a short 2-3 minute walk to the sandy shores. Sit and enjoy a cup of coffee in the morning or a glass of wine at night on the over 100 foot wrap around porch while taking in the ocean views. Book it while you can!